Building mindfulness, health & wellbeing to the BEAT of the Drum! When we drum together, we feel instantly connected, joyful and empowered. 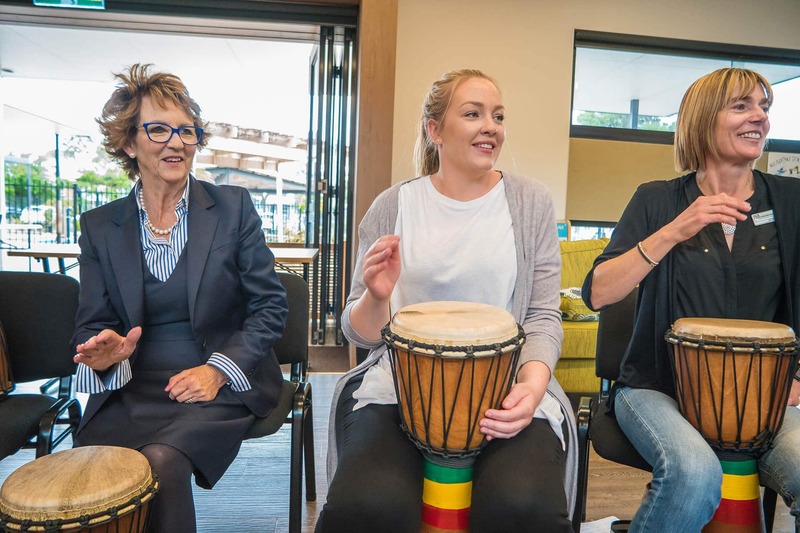 A natural healer - rhythm and group drumming provide powerful health benefits and metaphors for living life that leave participants feeling positive, relaxed, rejuvenated, and inspired. There’s a growing body of research on the therapeutic effects of group drumming. Ground breaking studies show drumming benefits the immune system, stress levels and mood. It also shows that repetitive drumming changes brain wave activity, inducing a state of calm and focused awareness. In fact when we drum, we engage both hemispheres of our brain - simultaneously. The only other known ‘activity’ to do this is Meditation (done right). But there’s no hit and miss with Drumming! Because, through rhythmic entrainment drummers learn to quiet the distraction, regain focus, and calm breath and mind. This promotes relaxation, a healthy mind, and a new pathway to social belonging while improving overall health and wellbeing. So get off your devices and BANG a drum in our Mindfulness Drumming Workshops & Courses! Janine was very talented at teaching and instilling confidence in the group and it was lots of fun. Great workshop – enhanced our therapeutic work with participants. All participants found this very valuable. It was very enjoyable. The ERMHA team and the public enjoyed it thoroughly. Thank you!! If the opportunity arises, we will definitely use Afrobeat again. 🙂 I can’t suggest any improvements as I found all of my interactions with Afrobeat to be helpful. Thanks so much for the experience!! Our group, had the privilege & pleasure of participating in a workshop lead by Janine. The expertise and clear direction given by Janine enabled our group to be comfortable participating & learning African Drumming. Janine’s enthusiasm was evident & she passed this onto the group.